A Huge thank you to everyone who is leaving me links to your pages or posting them in the Flickr group!! I am getting so inspired by your pages and it makes me want to do even more with my pages. I LOVE this challenge. Not to mention, I have added like 50 new blogs to my reader now :) Are we ready for day 3?? Journal Prompt: Use your name as an Acrostic to tell us all a little bit about yourself. Get creative with this one. Awww - love this prompt and your journal page! This is great. Okay ... off to do mine and post it at Mama Flock, asap. Thank you for following me now, Janel! I feel super special and I'm even getting a few new people stopping by thanks to this project. So awesome. I had so much fun with this one. Thank you! 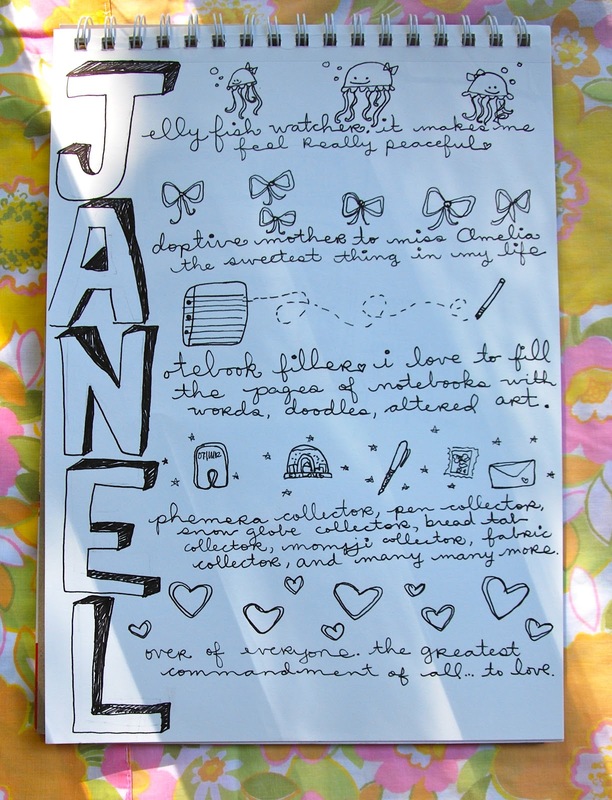 Love your page Janel. Going to try to figure one out for myself. So pretty! I haven't posted mine yet, but I'm keeping up so far! Not saying much since it's a weekend and only day 3! So pretty! I haven't posted mine yet, but I am keeping up so far. Not saying much since it's the weekend and only day 3! What a great prompt! Can't wait to get started! I LOVE your jellyfish drawings!!! We are so happy to have you! Your pages are so inspiring! !